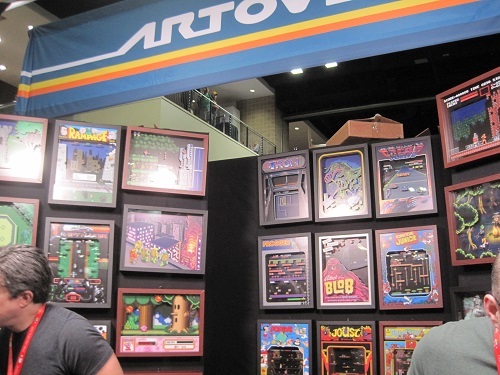 The Penny Arcade Expo, or PAX for short, is one of the largest video game conventions open to the public in the US. It started out in Seattle, then expanded to another show out East in Boston, and for the past few years, they’ve also had a show in San Antonio with PAX South. Since that’s only a few hours’ drive from where I live, I decided to go again this year along with my dad. Let’s check out what I saw. Most of what I do at these shows is set up meetings with PR professionals and developers to check out their games. But keep in mind there is no way I can see everything at these shows. One of my first meetings was with Blowfish Studios. I checked out one of their games called JackQuest. It’s a 2-D platformer with 16-bit style graphics and Metroid style exploration. You must save a girl who was kidnapped by a giant purple hand, and soon after entering a cave, you find a giant sword and must swing it to mow down enemies as well as run and jump and scoot up walls like Mega Man X. It had great play control so hopefully I’ll be able to review it when it comes out later this year. I swear I’ve reviewed a game almost just like this one before. 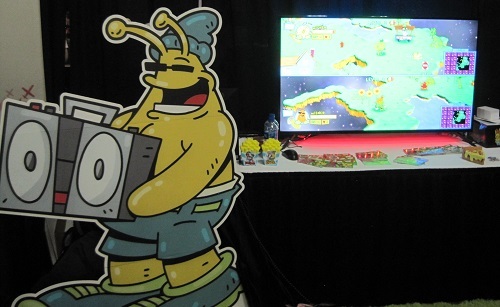 I played a lot of games like JackQuest from other developers at this year’s PAX South. They all had 16-bit graphics and 2-D Metroid style exploration. One was called Eagle Island, another was Forsaken Castle. 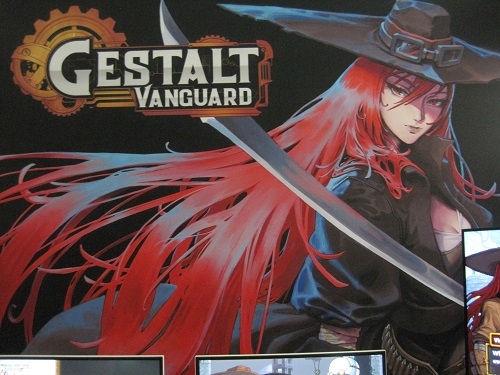 But the one that caught my eye the most was called Gestalt Vanguard. I like the character designs and the developer told me it mixed elements from Metroid and Final Fantasy 6, so that won me over right there. 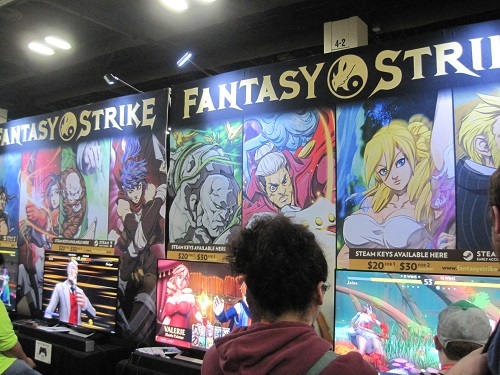 Right next to Blowfish’s booth was a display for a 2-D one on one fighter coming to PCs and consoles called Fantasy Strike. It looks great, and is designed for both beginners and experts, so I’m happy about that. Hope I get to review it, too! And speaking of 2-D one-on-one fighters that look great, Konsui Fighter is designed for mobile devices and features controls that work on that format very well. It also looks nice, too. The cartoony graphics almost look like something you’d see in a Guilty Gear or BlazBlue title. 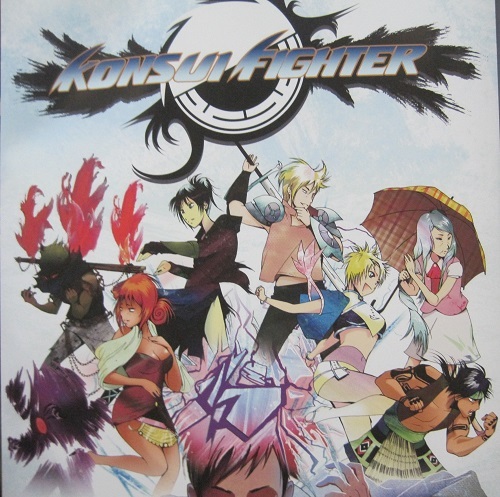 In the game, a man is in a coma (Konsui means Coma in Japanese I found out), and in his mind he must fight characters that represent his different emotions. Kind of interesting. 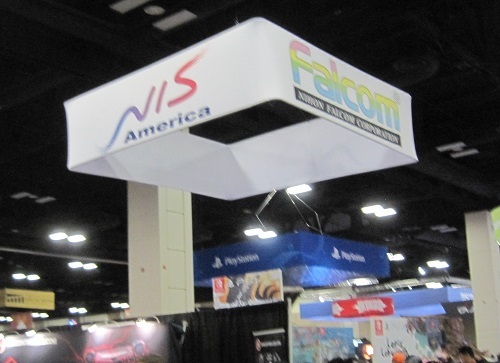 Surprisingly, I think my favorite company I visited at this year’s PAX South was NIS America. Which is unusual because I don’t play many of their games. They’re not bad games at all, they just publish a lot of long and complicated RPGs and strategy games, and I just don’t have time for them anymore. But they really were very nice at this year’s PAX South and treated me very well. They had TONS of games shown, probably more than any other company. There were a few that caught my eye, though. One was a PS4 version of the SNK 40th Anniversary Collection. I have it on Switch, and it’s great. Another one that surprised me was Lapis x Labyrinth. It’s a 2-D platformer dungeon crawler with fantastic sprite based graphics and gameplay where you can stack characters on top of each other to use their skills and make extra jumps. And did I mention the game looks great? Finally, NIS America has been working with Falcom with games like Ys 8, and they announced at PAX South that they are bringing out another one of Falcom’s hits: Trails of Cold Steel 3. I haven’t tried that series, but I’m glad that NIS is still working with Falcom. Another game company that I met with at PAX South that ended up being one of my favorites at the show was tinyBuild. Like NIS America, they had TONS of games shown and really treated me well, too. Most of the games they showed were for PC, but many of their games find their way to consoles at some point, too. Some of the game I remember they had were Lovely Planet 2. I reviewed the first one a few years ago. It’s a first person shooter with Katamari Damacy style graphics. Another new one was Totally Reliable Delivery Service. It’s a rag-doll physics-based 3-D platformer where you can deliver packages to people. Or not. Do whatever you want. It’s designed to be perfect for streaming, which a lot of tinyBuild’s games seem to be. Next was Secret Neighbor, a multiplayer version of their hit Hello Neighbor game with elements of hide and seek and tag. And last one that caught my eye was Swag & Sorcery. This is one of those games where you send out people to find stuff, and wait a while for them to come back with goodies for you to build up your kingdom with. But while you wait, you can play the game and do other things as well. Another one of my favorite games to play at PAX South was Bee Simulator. It’s a 3-D game where you are a bee and must fly around doing bee things like collect pollen, communicate with dances and pheromones, and battle rival wasps and other insects. It could even be considered educational, too. Even I learned a few things about bees. You can also do silly things like pop balloons with your stinger to scare people! And the game looks fantastic, too! In this frantic couch multiplayer game, you are a person made of blocks and must avoid bombs in an arena to be the last one standing in locations like a tree stump or a kitchen sink. It comes out soon and I hope I get to review it! I met with them last year and played their 2-D platformer game about artwork called The Painter’s Apprentice and I reviewed their educational turtle racing math game called Tortuga Racing. This year they had a new game called Osunia. It’s a 3-D game that is like Harvest Moon or Stardew Valley, but it’s set in the future! For only being three months into development, it looks great so far! They showed a bunch of games as well, but the one that caught my eye the most was Blazing Chrome, because it looked just like a 16-bit run and gun game, such as Contra 3, that I would’ve rented back in the day on the SNES! In this game you play as a couple in a long distance relationship, and it’s a 2-D puzzle platformer where you fold the scenery like a piece of paper on the back of a MAD Magazine to bring them together. It got quite a reaction from show goers, too! 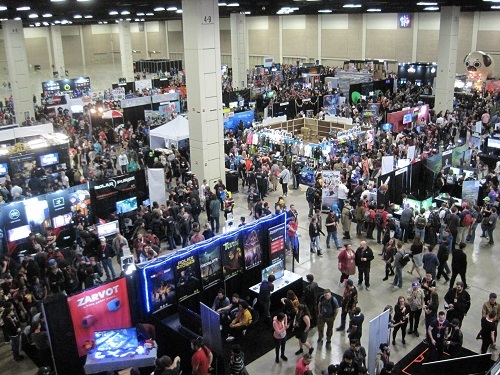 PAX South isn’t just about video games. They also have board games, and that section was just about as big! 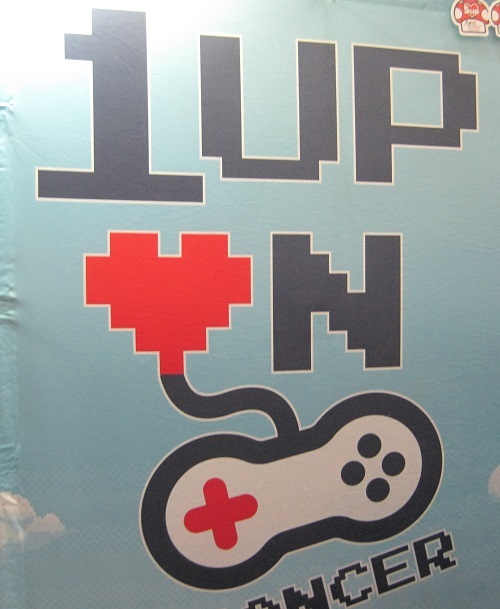 There are also a lot of schools and colleges there with programs that people can take on making games. And Mercury Learning sells books you can read about video game design and other things. I’ll be reviewing a few of their books later, so check back then to see what they’re like. 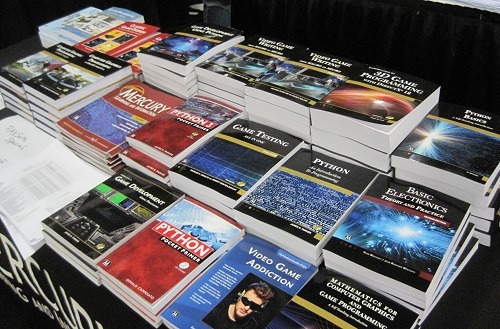 From what I can tell, these look like great books that no gaming college student or hobbyist should be without. 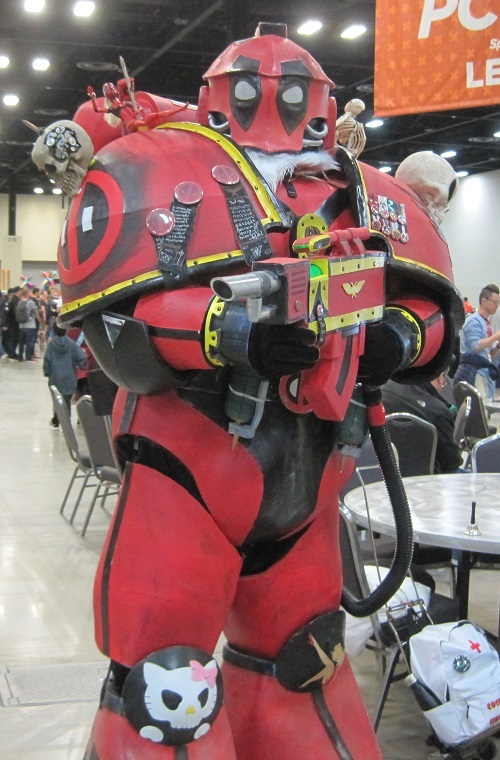 There are also charity groups at PAX South, too. I visited two of them. The first was 1upOnCancer. After the former president of Nintendo, Satoru Iwata, passed away from cancer, this group was formed to raise money for adult cancer patients. Seems like they have locations near where I live, too, so you might hear more about them from me later! The other charity group I visited was Stack Up. They send video games to US military overseas. At their booth, they had a contest where you could win raffle tickets by how many push-ups you could do in a minute. I did 55 push-ups in a minute there, so I guess that wasn’t too shabby. Bandai Namco is my favorite video game company. Well, actually just the Namco part, as they make games like Pac-Man, Soul Calibur, Katamari Damacy, and more! They were at PAX South showing two games. 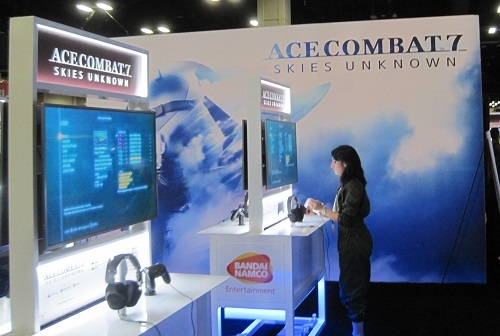 The first was Ace Combat 7, an arcade style flight combat game. I have some younger brothers who are really looking forward to this game, so I tried to play it at the show but the line was too long. The booth attendees at that station were wearing military outfits, so that was a cute idea. The other game they were showing was Jump Force, a 3-D fighting game starring popular anime characters. After you played it, you could get a thing of “Cup Noodles” ramen, as they are doing a promotion with the game. I don’t know about you, but I would’ve been disappointed if I waited in a long line to play, only to get a cup of ramen as a freebie, since you can get those for pocket change at the grocery store. But then, I don’t like ramen much anyway. Another one of my favorite game companies, Capcom, was also at PAX. They were mostly showing off Resident Evil 2 (a remake I’m guessing), and Devil May Cry 5. What surprised me is they didn’t have a store at their booth this year. 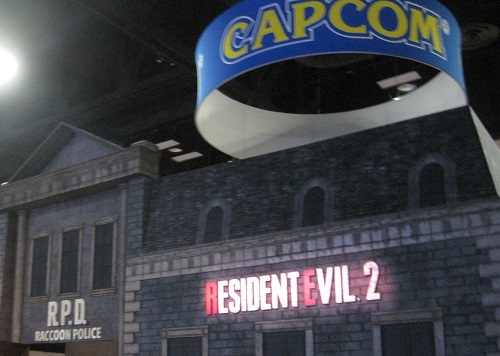 Anyway, here’s a picture of the RE2 area that looked like a haunted house. And here’s a police car with some scary zombie parts on top of it. 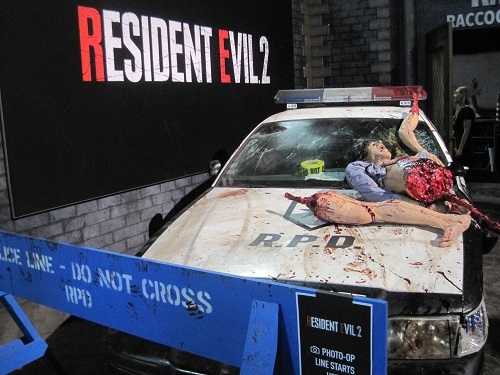 I think Capcom has used that same police car in many other E3’s I’ve been to in the past. A while back, a new ToeJam & Earl game subtitled Back in the Groove was released for PC, and now it’s coming to consoles as well. I hope I get to review it! 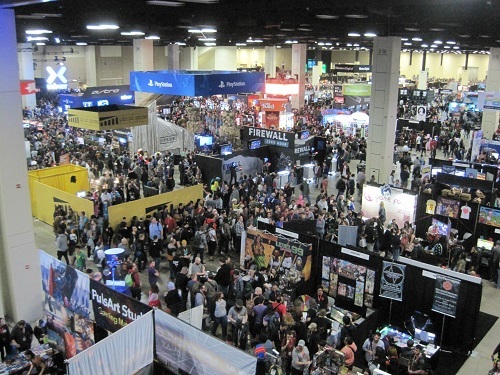 At PAX South, there are also many companies selling merchandise, like T-shirts and other game accessories. My favorite was Artovision. They take popular screenshots from games, and put them on framed layers of glass so they have a bit of a 3-D effect. They had so many cool ones and I really wanted some, but they cost 120 bucks each. They were really nice, so I’m sure they’re really worth that, but it was still out of my price range so I didn’t get any. Another merchandise booth that caught my eye was one with a giant inflatable dog and a doghouse made out of candy that you could walk into. Very cute. And here’s some pictures that I didn’t know where to put so they go here. 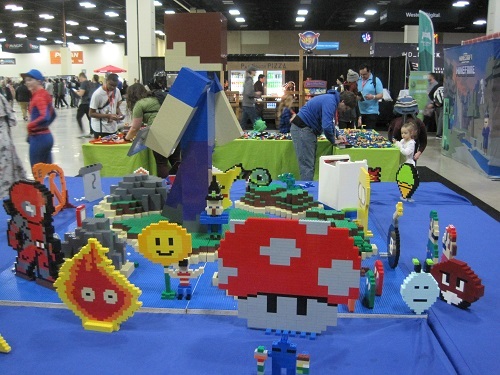 There was a Minecraft booth where you could build things with LEGOs, so here’s a table with what people built on display. 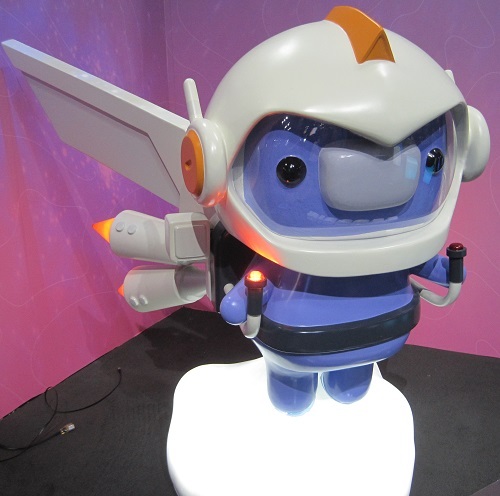 I forget what booth this robot was from, but he was a cute little guy so I took a picture of him. You could take an escalator to get a bird’s eye view of the show, so I took some shots of that again. The show was much more crowded this year, so attendance was up. So much so that I may only go Friday next year, since it was impossible to do anything there on Saturday. Here’s a picture from another angle. I didn’t even take any pictures of the board game area, which was just as crowded! At night we ate at a German restaurant on the San Antonio Riverwalk. It was good, but our food took too long and it was really more of a bar than a restaurant, so I may not go back. 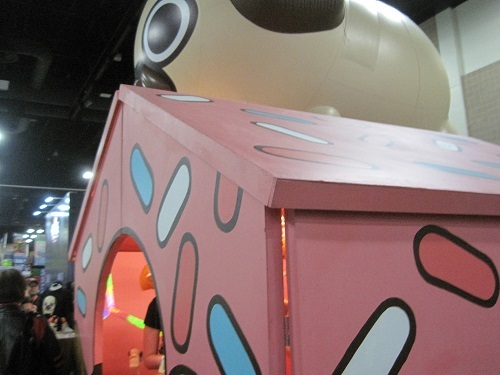 I did like how they decorated it for PAX South showgoers, though. I’m such a sucker for Pac-Man. 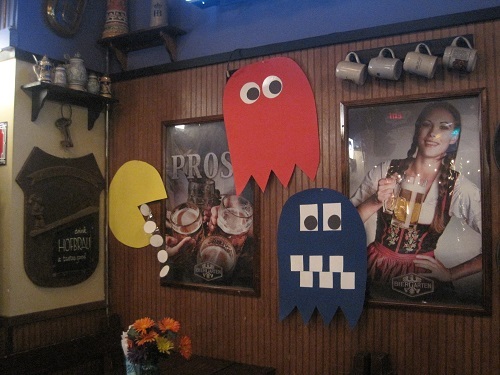 At these shows, some people like to dress as their favorite video game characters. I didn’t take too many pictures of them this year because most people were just either Mario or Overwatch characters. But I did get a chance to snap a few shots of costumes that caught my eye. I don’t know what this is. Some kind of Deadpool robot…thing? I don’t know. But this costume was really big and cool so I took a picture of it. 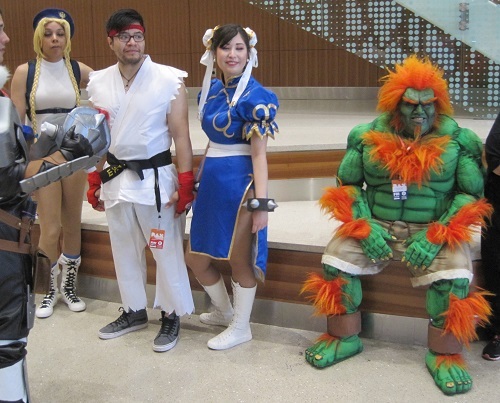 And here are some Street Fighter characters just hanging out. Oh, hi Cammy! (sigh) I think my favorite, though, is Blanka over there on the right. He’s sitting there just chillin’ and happy to be there! I love those Artovision shadowboxes. I’d take Guantlet, Dragon’s Lair and a bunch of others.